Belle is everything I have been hoping for! She has all the qualities we look for - beautiful structure, wonderful breed type, a gorgeous head, effortless movement, a fantastic temperament, brains, instinct and a great work ethic! She is my 3rd generation and has all of the wonderful qualities of her mother, Tessa, and grandmother, Lia. !n 2015, Belle was Reserve High in Trial at the Cascade PWC herding trials and High Scoring Pembroke and the following day was High in Trial at the all breed AKC trial. I hope to earn her last three legs for her Masters Started title in 2016. Tessa is a gorgeous black-headed tri girl who has the beauty, brains and talent of her mother, Lia. Tessa is an absolute natural at herding, easily earned her Rally Novice title with very high scores and placements and earned her CD in 4 trials. Tessa competed in the Triathlon at the 2012 Pembroke National Specialty and placed in every event she entered and missed out on winning the Triathlon by placing 2nd out of 37 entries, by ONE point! Tessa earned her Master Started herding title on sheep with 11 consecutive qualifying scores, most high in placement In 2014, she was Reserve High in Trial at the PWCSC AKC trials and in 2015 earned the Sue Ruker Memorial award as the highest scoring Pembroke at the same trials. She is now retired and enjoying the life as Queen of Hylane and all around happy and healthy ranch dog. Sarah is a beautiful sable girl who lives with her brother Bobke and the Azevedo family. She is Holly’s running partner and enjoys agility, as well as Rally obedience. 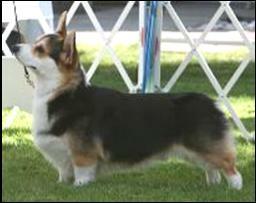 She also was the STAR at a herding instinct test, showing the same drive and talent as her mother and older sister. I believe Sarah will have a very bright future! Bobke is Sarah’s litter brother and he also has just begun his conformation and performance careers. Bobke lives with and is co-owned by Holly Azevedo and her family. He is about to begin competition in Rally Obedience and start agility training. Bobke brings a lot of joy to his family and makes me very proud!